Hello. I'm calling to urge Sen./Rep. _______ to stand up for the open internet. 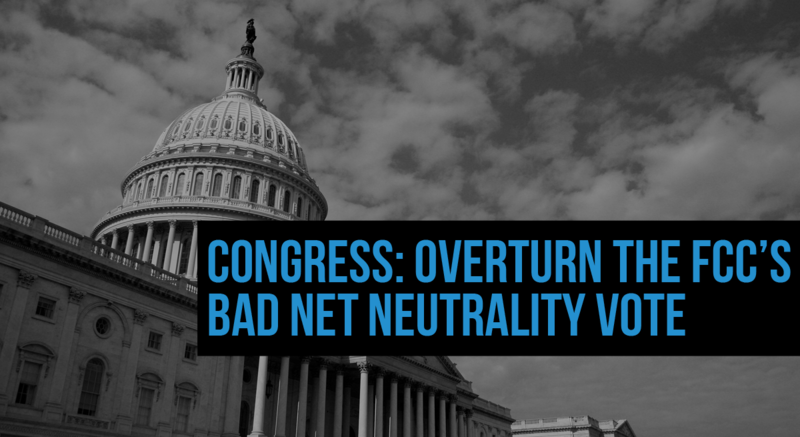 Please use the CRA to pass a Resolution of Disapproval reversing the FCC's bad Net Neutrality vote. Thank you. That’s why we’re urging Congress to use the Congressional Review Act (CRA) to pass a “resolution of disapproval” to overturn this vote. These numbers should be celebrated as a victory, but we haven’t won yet. For Congress to reverse the FCC’s Net Neutrality repeal, we need to win a simple majority in both chambers. Call your senators and representative today and tell them to join the effort to restore the FCC’s Net Neutrality rules. Using the CRA to overturn the FCC’s Net Neutrality vote is the best option we have to restore the open-internet rules. This would also bypass the threat of Congress passing an industry-friendly bill that would leave us with a watered-down version of the rules we once had. Urge your members of Congress to use the CRA to reverse the FCC's Net Neutrality-killing vote today.